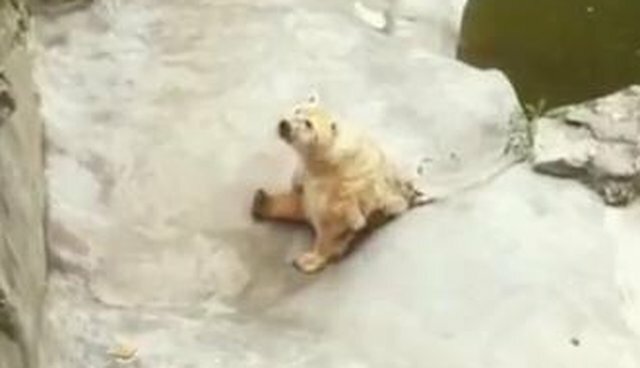 A video has emerged showing what might just be the most miserable polar bear in the world. The clip, reportedly taken at Belgrade Zoo in Serbia, shows an emaciated bear dragging himself the stone floor of his enclosure, a murky green pool behind him. His back legs seem to have collapsed beneath him, and his movements are weak and shaky. His white fur is stained with mud or, as some have suggested, feces. After appearing to struggle, he manages to prop his back legs up behind him, taking a few faltering steps forward until he can reach a piece of food on the ground. Every few seconds, he looks up from his pit at the faces of tourists looking down at him. The video was posted on Wednesday by ORPAK Kruševac, which appears to be an animal welfare group, though it's unclear when the video was taken. Little else is known about the bear or his condition. "It's clear just from that video that that polar bear has sustained some sort of injury or some sort of muscle atrophy that's making it hard to even stand," Adam Roberts, CEO of Born Free USA, told The Dodo. "That also means there's going to be pain when that animal tries to stand, or walk, or even, ultimately, lie down." The clip is reminiscent of Arturo, the only captive polar bear in Argentina who was deemed one of the world's saddest animals. Kept entirely alone at nearly 30 years old in the up to 100-degree weather, he slowly went "insane." Visitors observed him displaying repetitive stereotypic behaviors to cope with the stress, such as swinging his head back and forth over and over again. He passed away earlier this month despite a years-long effort to save him. "There are some species that are completely ill-suited to life in a zoo, and among them are large carnivores such as lions, tigers or polar bears, or other large mammals such as elephants," Roberts said. "They often end up in deplorable conditions and alone." Unfortunately, it looks like the polar bear might not be the only one suffering at the Belgrade Zoo. ORPAK Kruševac also posted a video of what they say is a lion at a zoo, pacing back and forth in a sunken fenced-in enclosure. While the zoo has mixed reviews online, several visitors have commented on the small, barren spaces reportedly allotted to the animals. "I walked out crying," one reviewer wrote. Little action can be taken until more details come to light about the bear and where he's kept. But Roberts said he hopes that, in the meantime, the clip will remind people to think twice before they support facilities that keep large animals like polar bears in substandard conditions. "What I think that video amplifies is that the modern zoo is ill-equipped to provide wild animals with the welfare they require," he said. "Whether it's the environment, having others of their own kind, or environmental enrichment, zoos repeatedly fail ... [and] polar bears in zoos does nothing to address the conservation threats facing the species in the wild, and, really, that's got to be our focus right now." The Dodo will update this post if more information becomes available. In the meantime, you can sign a petition here seeking to improve the welfare for the animals at the zoo.